France's World Cup star Kylian Mbappe joined regulars Cristiano Ronaldo and Lionel Messi on the shortlist for The Best FIFA Men's player award, world soccer's governing body announced on Tuesday. Ronaldo, who has won the award for the last two years, helped Real Madrid claim a third consecutive Champions League crown before securing a close season transfer to Juventus. Argentine forward Messi topped the scoring charts with 34 goals in Barcelona's third La Liga title win in the last four seasons. 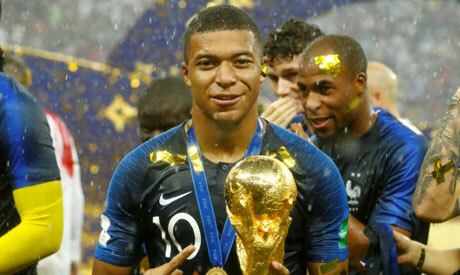 The 19-year-old Mbappe followed up a domestic treble with Paris St Germain with a string of impressive performances in France's World Cup winning campaign. He became only the second teenager after Pele to score in a World Cup final as France powered past Croatia 4-2 to win the sport's top prize for the second time, 20 years after their first triumph. Mbappe was joined by compatriot Antoine Griezmann and Raphael Varane on the 10-man shortlist. France coach Didier Deschamps and former Real Madrid boss Zinedine Zidane head the nominees for the men's coach of the year award. England manager Gareth Southgate was also named on the shortlist after guiding the national team to a first World Cup semi-final in 28 years. Four women and six men are part of the 10-candidate list for the women's coach of the year award. The nominations include Asako Takakura, who guided Japan to the Women's Asian Cup title and Reynald Pedros, whose Olympique Lyonnais won a third consecutive Champions League and the French league title. England full back Lucy Bronze, who won the European crown in her first season with Lyon, was nominated for the women's player of the year. The 26-year-old is one of six Lyon players on the shortlist, featuring alongside Ada Hegerberg, Saki Kumagai, Dzsenifer Marozsan and French duo Amandine Henry and Wendie Renard. The three finalists for each award will be revealed at a later date, with the winners to be announced in a ceremony in London on Sept. 24. Cristiano Ronaldo (Portugal/Real Madrid/Juventus); Kevin De Bruyne (Belgium/Manchester City); Antoine Griezmann (France/Atletico Madrid); Eden Hazard (Belgium/Chelsea); Harry Kane (England/Tottenham Hotspur); Kylian Mbappe (France/Paris Saint-Germain); Lionel Messi (Argentina/Barcelona); Luka Modric (Croatia/Real Madrid); Mohammed Salah (Egypt/Liverpool); Raphael Varane (France/Real Madrid). Lucy Bronze (England/Olympique Lyonnais); Pernille Harder (Denmark/VfL Wolfsburg); Ada Hegerberg (Norway/Olympique Lyonnais); Amandine Henry (France/Olympique Lyonnais); Samantha Kerr (Australia/Sky Blue FC/Perth Glory FC/Chicago Red Stars); Saki Kumagai (Japan/Olympique Lyonnais); Dzsenifer Marozsan (Germany/Olympique Lyonnais); Marta (Brazil/Orlando Pride); Megan Rapinoe (USA/Seattle Reign); Wendie Renard (France/Olympique Lyonnais). Massimiliano Allegri (Italy/Juventus); Stanislav Cherchesov (Russia/Russian national team); Zlatko Dalic (Croatia/Croatian national team); Didier Deschamps (France/France national team); Pep Guardiola (Spain/Manchester City); Juergen Klopp (Germany/Liverpool); Roberto Martinez (Spain/Belgian national team); Diego Simeone (Argentina/Atletico Madrid); Gareth Southgate (England/English national team); Ernesto Valverde (Spain/Barcelona); Zinedine Zidane (France/Real Madrid).